Things have been heating up this summer at Uftring Auto Group stores. Two of our dealerships, Uftring Chrysler Dodge Jeep in Pekin and Uftring Chevy Saab in Washington, are receiving some high profile vehicles in their showrooms. The Jeep Grand Cherokee and the Saab 9-5 are impressive new vehicles. Both have been redesigned this year, and they look nothing less than stellar. We are more than happy to have them in our stores! At the Uftring Pekin Chrysler Dodge Jeep dealership, the brand new 2011 Jeep Grand Cherokee rolled in on Thursday evening, driven from Chicago by Mr. Gary Uftring himself. This vehicle is receiving a lot of praise from the press for its redesign. It looks a lot more mature and modern than the previous Grand Cherokee, has more room inside, is armed to the teeth with technology, has award winning safety features, and comes with a great standard setup and a lot of upgrade options. It's equally at home crossing the road in the city or the stream in the forest. We'll have a full assortment of these vehicles in stock at Uftring Pekin in the near future, and we'll keep you informed about when we'll have them on the lot. In the meantime, you can check out the 2011 Jeep Grand Cherokee in our showroom, and read about it online at our website! 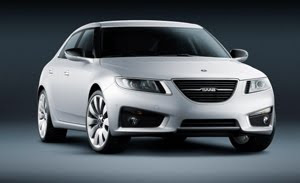 Over in Washington, Uftring Chevy Saab will soon be the proud recipient of a 2011 Saab 9-5. This is the first car to be released since Saab's ownership under Spyker Cars. One look at the Saab 9-5 will tell you that the new owners mean business. Spyker is driving Saab into a new era that looks extremely promising, with more redesigns, revivals, and new models due in the next few years. The new Saab 9-5 is the first taste of what's in store. It's clearly inspired by Saab's jet heritage, with sleek angles and a fierce stance that looks like its about to takeoff. Piloting one of these cars would be no less thrilling. It has a V6 engine that comes in at just under 300 horsepower. It's also very safe with 8 airbags and large 18-inch wheels for greater traction. Most of the inside features glow Saab green, and it looks very cool. It's so cool you'll probably wish it was night all of the time. More detailed information is available on our Saab 9-5 Info Page. We are excited to show you this car! Hopefully you can make it out to the showrooms to see these vehicles in person! 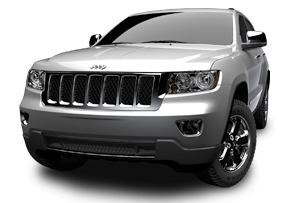 We'd love to have you come in and tell you all about the 2011 Jeep Grand Cherokee and the 2011 Saab 9-5. In the meantime, feel free to browse our Jeep and Saab inventory. Look for pictures of the showroom vehicles to be put up in the near future. You should fan our Uftring Chevy Saab and Uftring Chrysler Dodge Jeep pages on Facebook. It will allow you to keep up on the latest happenings at our dealerships, plus hear about special deals on inventory and service. And it boosts our self confidence. See? Everyone wins.